Arthur Jonathan Wall Jr. (November 25, 1923 – October 31, 2001) was an American professional golfer, the winner of the Masters Tournament in 1959. Born and raised in Honesdale, Pennsylvania, Wall and his younger brother "Dewey" caddied for their parents, starting around age ten, and began playing shortly after. The brothers served in the military during World War II, Art in the Army Air Forces, and Dewey in the Navy: he was killed at age 20 in October 1944 when his submarine USS Shark was sunk in the Pacific near Taiwan. Wall played collegiate golf at Duke University in Durham, North Carolina, and graduated in 1949 with a business degree. Wall won fourteen titles on the PGA Tour, including four in 1959. That year he was chosen as the PGA Player of the Year, and also won the money title and Vardon Trophy for lowest scoring average. His most notable career achievement was his victory in 1959 at the Masters. In the final round, he birdied five of his last six holes to shoot a 66 and overtake Cary Middlecoff and defending champion Arnold Palmer. He was a member of three United States Ryder Cup teams: 1957, 1959, and 1961. Wall is also notable for sinking 45 holes-in-one in his playing career (including casual rounds), a world record for many years. 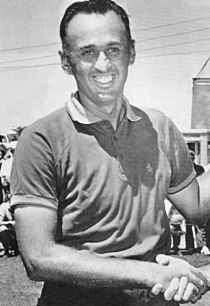 Wall's final tour win came as a grandfather at age 51 years 7 months at the Greater Milwaukee Open in 1975, which his first tour win in nine years. Since this win 44 years ago, no older player has won on tour; the closest was Davis Love III at age 51 years 4 months in 2015. The oldest remains Sam Snead, who was nearly 53 in 1965 at his 82nd and final tour win at the Greater Greensboro Open. Wall died at age 77 in Scranton, Pennsylvania, of respiratory failure after a lengthy illness, and is buried at Glen Dyberry Cemetery in Honesdale. Note: Wall never played in The Open Championship. ^ Gundelfinger, Phil (April 6, 1959). "Wall's sensational rally takes Masters". Pittsburgh Post-Gazette. p. 26. ^ a b "Art Wall Jr., 77; golfer had 40 holes in one". Los Angeles Times. Associated Press. November 1, 2001. Retrieved June 13, 2018. ^ Passov, Joe (September 24, 2009). "50 years ago, game's best player was Art Wall, not Arnold Palmer". Golf.com. Retrieved June 13, 2018. ^ "Art Wall, Jr.: still living the game". Tucson Citizen. (Arizona). (part 1). May 3, 1994. Retrieved June 13, 2018. ^ "Art Wall, Jr.: still living the game". Tucson Citizen. (Arizona). (part 2). May 3, 1994. Retrieved June 13, 2018. ^ Porter, David L. (1995). "Biographical Dictionary of American Sports: 1992-1995 (Art Wall)". Greenwood Press. p. 574. ^ "William Riefler Wall". On Eternal Patrol. Retrieved June 13, 2018. ^ a b c "Art Wall Jr. – Golfer, 77". The New York Times. November 1, 2001. Archived from the original on January 30, 2011. Retrieved March 8, 2011. ^ a b "Art Wall Jr". Autograph Magazine. Retrieved March 8, 2011. ^ a b Brown, Gwilym (April 13, 1959). "Wall was wondrous". Sports Illustrated. p. 16. ^ Wright, Alfred (January 18, 1960). "The young pros go after the veterans". Sports Illustrated. p. 38. ^ "Wall birdies five of final 6; wins Masters in epic finish". Spokesman-Review. (Spokane, Washington). Associated Press. April 6, 1959. p. 10. ^ Kindred, Dave (October 8, 2007). Do you believe her?. ESPN. ^ Bunch, Ken (July 7, 1975). "Old tiger Wall on prowl with GMO win". Milwaukee Sentinel. p. 1, part 2. ^ "Art Wall a winner at Milwaukee". Daytona Beach Morning Journal. (Florida). Associated Press. July 7, 1975. p. 1C. ^ "I don't think 51 is old - golfer Art Wall". Sarasota Herald-Tribune. (Florida). Associated Press. July 7, 1975. p. 4C. ^ "Snead eyes Masters title". Eugene Register-Guard. (Oregon). Associated Press. April 5, 1965. p. 2B. Wikimedia Commons has media related to Art Wall Jr..
Duke University Athletics Hall of Fame – Art Wall Jr.
Trenham Golf History – Art Wall Jr.